Bakken crude can realize premium prices by moving west. The only problem is there isn't much receipt capacity. Long distances, very little pipeline capacity, and limited rail mean it's hard to move crude West out of ND. Recent estimates show more than 40,000 b/d of Bakken crude is being transported to Washington, but only a few thousand barrels per day is making its way south into California. That's a problem. West Coast refineries are paying over $105 per barrel for Alaskan crude, while oil in North Dakota is trading for as little as $80 per barrel. Assuming it would cost $15 per barrel to move crude by rail to Southern California, those looking to profit stand to make $10+ per barrel based on current spreads. That's more than enough incentive for refineries and midstream companies, but its easier said than done. "It's entirely possible California refiners decide they can't get this done in time to catch the arbitrage, so refiners wouldn't get the benefit of low-cost crude from the Midcontinent," said David Hackett, president of energy consultancy Stillwater Associates. East Coast and Gulf Coast refiners are enjoying some of the best margins in the world, but on the West Coast, refiners are missing the party. If significant rail receipt capacity isn't built or pipelines converted to oil, refineries might miss out on the benefits of the current domestic oil boom all together. Bakken crude can help with first issue, but they're going to have to get the state on their side to make advances with the second issue. 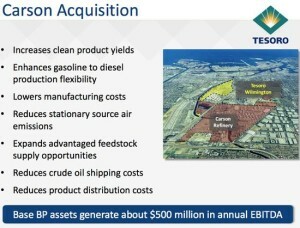 Coming off a recent $2.5 billion acquisition of the Carson Refinery from BP, Tesoro has plenty at stake and I don't expect they'll let the current oil boom pass them by.